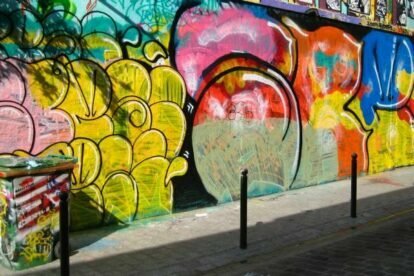 Paris likes to consider itself at the forefront of the international street art movement, and it certainly does offer several interesting sites to visit. Probably the most impressive of all is the Rue Dénoyez, which has the added advantage of forming a corner with the popular Aux Folies bar! For a long time this street was a rundown corner of the city, but it is now undergoing complete renovation. The row of brightly coloured galleries and bars, semi-squats really, are now being demolished, but the monumental wall with a constantly changing selection of excellent murals opposite will not be going anywhere soon. The street is Belleville in a very colourful nutshell. Young artists, Tunisian men playing cards, cool bars, hotels for the homeless, children playing football, and bloggers stopping to take photographs!